I can understand the curiosity many of the geeks might have to see what’s inside an iPhone, but then there is little one can do to figure out the details. At the end, we all know that it will be a compact mini form factor compressed into a small case that ends up being the beautiful iPhone 4. As you can see the rear-facing camera is removed from the iPhone 4. 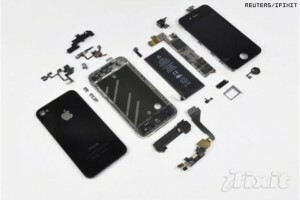 The iPhone had chips from Samsung Electronics, Micron Technology and STMicroelectronics. 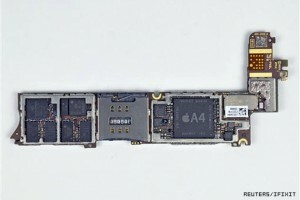 A connector on the logic board is removed from the iPhone 4. The iPhone 4’s stainless steel was described as “brilliant” by iFixit which said that the new casing not just makes the iPhone 4 a stronger phone but also lets it have much better reception than its predecessors. 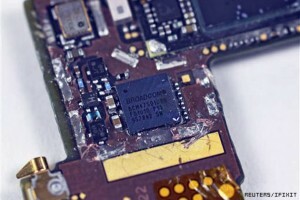 The logic board is removed from the phone. The A4 processor is clearly seen on the logic board. The processor is the same as in the iPad and is a custom designed processor by Apple. The Broadcom chip is shown here in the picture. This chip serves as a GPS reciever for the phone. An overview of the teardown is shown in the picture. iFixit has done a good job over the tear down. Their final verdict is don’t break the glass screen of your iPhone. The iPhone 4 uses aluminosilcate glass that is twenty times stiffer and thirty times stronger than plastic. However the glass, digitizer, and LCD panel are all glued together so if you happen to break the glass, you will have to pay big bucks to get that fixed. Previous Skype promotion – Free phone calls for a month!! Next BP’s one more final attempt? Has technology failed us?